The mastermind behind the Varien moniker is Nick Kaelar. His vast musical experience has landed him songwriting for top Korean pop acts like VIXX, spots for composing music for movies such as 300: Rise of an Empire, The Walking Dead, and Injustice 2, as well as being on the audio team for Furious 7 and doing official audio work for Drive. Kaelar has also collaborated with Skrillex, Two Steps from Hell, and Celldweller. With his multi-genre, jazz-trained wizardry, and ever-evolving sound, Varien crafts music of all kinds while keeping a steady sense of cinematic storytelling. He is also heavily influenced by the Y2K era and Japanese visual kei. I like to combine the traditional and unconventional in a familiar setting. I love to use orchestral instruments, electric guitars, hang drums... things like blown bottles, Amen breaks and kalimbas but in the genres of dubstep, drumstep, electro and more! The combination of synth noises and organic noises lends itself to very unique textures! I personally am a jazz trained multi-instrumentalist from Tampa, FL and I love all music from progressive metal to gypsy jazz to electro house. I have been in metal bands, have produced everything from trip hop to breakcore and just genuinely enjoy the music making process! 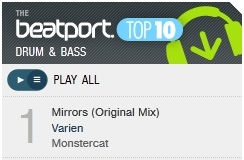 Varien is the synthesis of all of the above, but in the median of modern, club-friendly electronic dance music. I also compose soundtracks to video games and short films! I've always been around music. Since day one I was exposed to people like Beethoven, Pantera, Rush, The Moody Blues, etc. It only seemed natural to continue my journey and eventually I self-taught myself piano, music theory and production! I got FL Studio 8 at 19, sat down and did nothing but learn learn learn. I tried other DAWs like Ableton and Reason, but nothing got my ideas out faster and better than FL Studio. I loved it when I first picked it up and I love it to this day. My production environment is pretty simple actually! I have some Samson Resolv A8 monitors, an M-Audio Keystation 49e and thats about it! I am mostly a software person, and I have quite a collection of sample libraries I use with Native Instruments Kontakt.